Architectural innovations centre around the Kelston Deaf Education Centre satellite unit and the Ministry of Education’s vision for the delivery of Modern Learning Environments around the country. The two storey building shape (learning arms) encloses an internal courtyard allowing for maximum sun angles and protection from the prevailing westerly and south westerly winds. A key structural innovation was the distinctive feature brick wall to the front of the gym and main entry. This was designed to accommodate the flexible nature of the gym’s portal framed structure and ensure compliance with today’s stringent earthquake requirements. 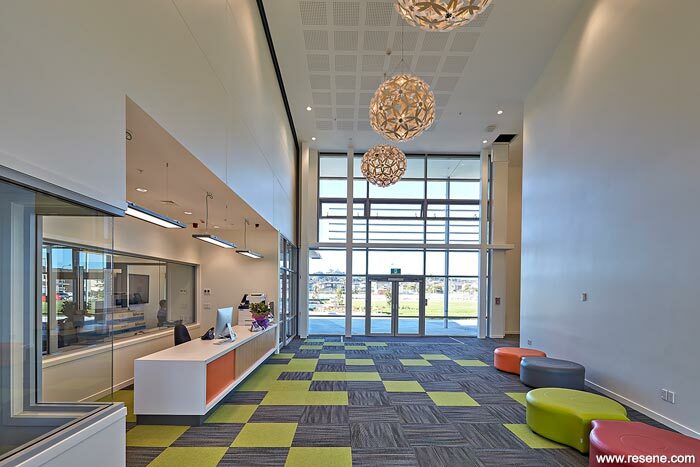 Designed to achieve a 5 star Green Built rating, every feature of the school is designed to minimise energy consumption and operational costs. 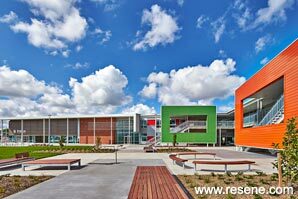 A primary school should be a vibrant and stimulating environment. 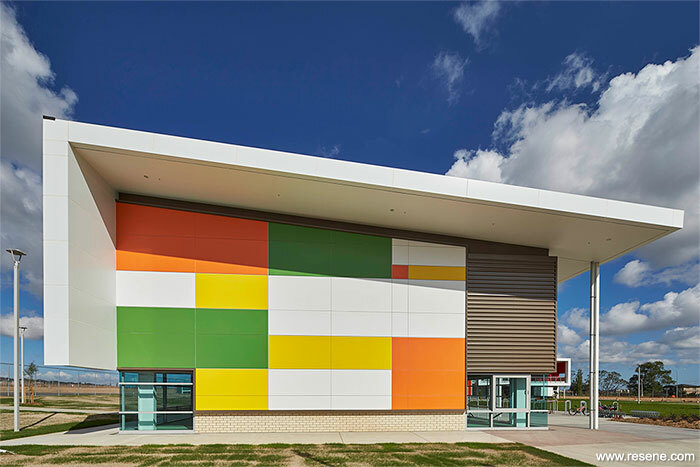 For the school the patchwork of vibrant colours, which were made up of Resene Black White (grey white), Resene Bilbao (sharp green), Resene Chilean Fire (vibrant orange) and Resene Spotlight (graphic yellow) on the east side of the multi-purpose hall is a bright and playful backdrop to the adjacent residential streets. The use of green and red/orange reflects the history of the region. Green refers to the horticultural history of the region and red/orange the volcanic history that was Te Puke Otara. Resene Bullseye (cherry red) is also used on the exterior as an extra pop of colour. Inside the paint colour palette is relatively neutral with Resene Black White, Resene Half Akaroa (palest grey) and Resene Quarter Wheatfield (sharp cream white). This project won the Resene Total Colour Education Junior Award. The judges thought: "Colour is used to reflect the history of the region bringing together the horticultural history and volcanic history. It’s a playful colour scheme, like giant building blocks of colour. Coloured picture frames define the circulation stairs between the floors and provide a welcome to children and adults alike. The patchwork of vibrant colours is a striking contrast to the adjacent neutrally coloured residential streets. Children have a strong sense that they have arrived somewhere different, vibrant and stimulating, ready for a new day of adventures and learning to begin.